You are currently browsing the tag archive for the ‘Bailey’ tag. I love fountains and my home, New York City, is an excellent place to witness all manner of lovely ornamental waterworks. No doubt other bloggers have extolled Manhattan’s many famous fountains, so I thought I would briefly write about my favorite fountain in Brooklyn, the Bailey Fountain, which is located at Grand Army Plaza at the north end of Prospect Park. The fountain lies beyond the huge triumphal arch which celebrates the victorious conclusion of the American Civil War. Both fountain and arch lie on a traffic island surrounded at all times by dangerous rivers of vehicles. 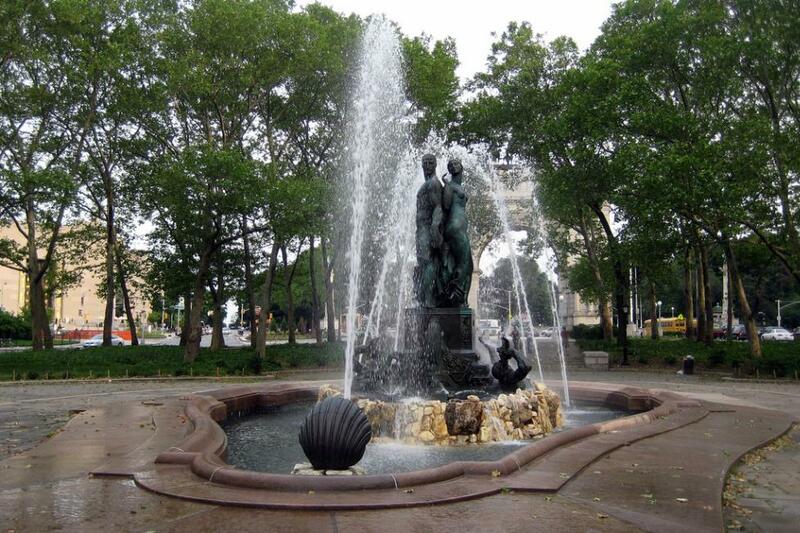 The Bailey Fountain was conceived of during the late nineteen twenties but it was built in 1932. The tension between these two very different eras is noticeable in the ferocity and severity of the classical figures. The fountain seems to be an allegory of abundance however the individual figures look like they instead portray greed, abandon, and resignation. 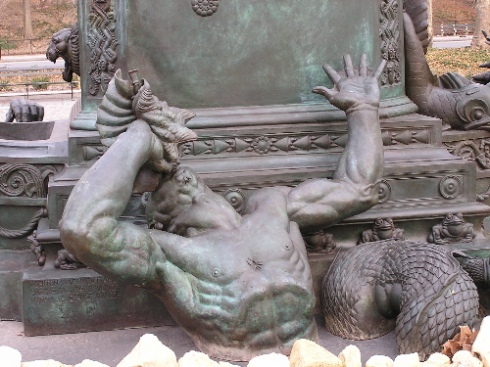 The fountain is the work of architect Edgerton Swarthout and the bronze sculptures were crafted by Eugene Savage. I think the final work might transcend what either had initially intended. 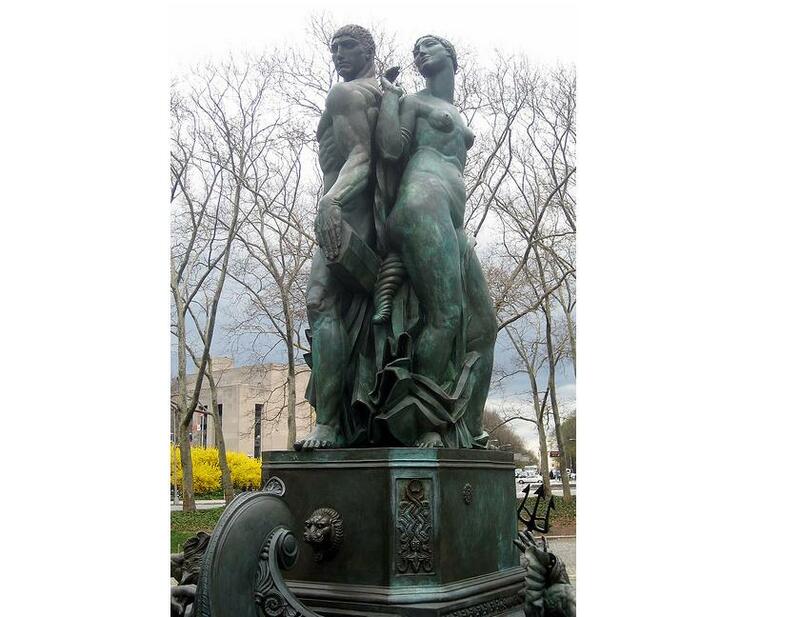 Bailey fountain portrays a pair of magnificent bronze nudes standing on the deck of a ship. 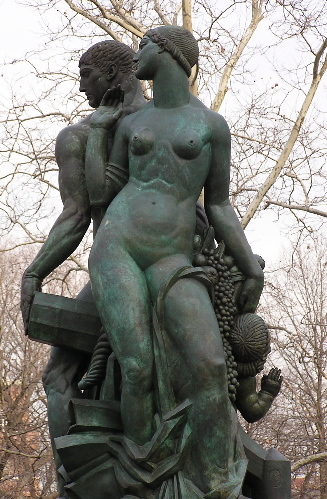 The two respectively represent wisdom and felicity. I assume the man is wisdom and the woman is felicity, but it is not easy to tell because she does not look happy and he does not look wise. Although they both look powerful the figures seem wan and resigned. Additionally, although they are connected, their backs are forever turned to each other. A bestial Neptune sprawls on the prow as grim Tritons sound horns and writhe on both sides of the boat. Strange frog and fish faces spew white water around the tormented figures. The boat and its inhabitants represent humankind and the figures in the water represent chance and the forces of nature. 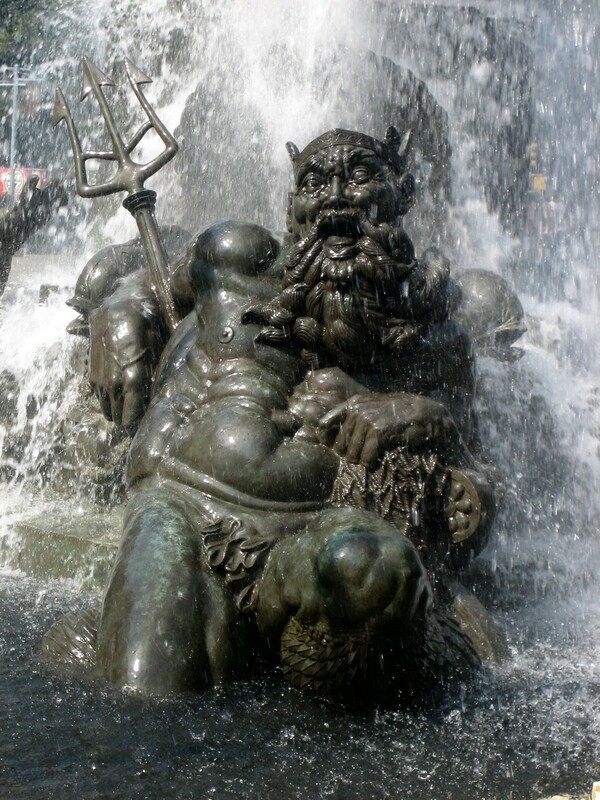 When contemplating the fountain it is easy to pitch your mind back to the time of the great depression and see Neptune and his fierce watery compatriots as the unquenchable appetite and greed which spawned the many hardships of that era. The Bailey fountain replaced a bizarre Victorian electric water show which was the rainbow-colored high-pressured wonder of its time (but which did not hold up well since it combined early electrical technology, 19th century plumbing, and Brooklyn winters). I first saw the Bailey fountain in the mid-nineties when it was broken and dry: large portions of the work were painted the same aqua blue as swimming pools. The plaza seemed deserted except for the eternal traffic, the sinister vine covered trees, and a huge tribe of rats. Great hunks of granite pavement had been broken apart by frost heave (or some other urban force) and melancholy pervaded the scene. A lone homeless person sidled up and sadly informed me that the fountain was haunted and, in the lugubrious twilight, I half believed him. Today, however, the fountain has been restored, and you can contemplate its enigmatic meaning in a much more pleasant surrounding.